If you're trying to make your final decision on a blender, you might be wondering if the Vitamix 780 is the best pick. In this guide, I'll do a full Vitamix 780 review and comparison to help you make your final decision. I've owned multiple different blenders over the past 5 years (including a Vitamix which I love and use every day). Why I like the Vitamix 780 but it's not my #1 pick. How the Vitamix 780 compares to a wide range of other blenders (with comparison charts that are easy to follow). My personal experience with Vitamix and their warranty. I think the Vitamix 780 is great, especially because of it's easy to wipe down touch screen. Very impressive technology that's superior to the 780 with same power plus digital timer. Lower MSRP and longer standard warranty by 3-years. More budget-friendly option that's perfect for small families or singles. Can blend all the same things as other Vitamix models. 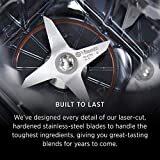 An option to consider if you can get it at a lower price than the Explorian E310. It's got a bigger container than the E310 - the same size as the 780. Keep reading for the full guide and to compare all the blenders in greater detail -- or use the links above to check out the blenders for yourself. Oh -- and if all these blenders aren't fitting your price range, be sure to see our best Vitamix alternatives. Where to Buy the Vitamix 780? What's the Price of the Vitamix 780? Should You Get a Reconditioned or Refurbished 780? As the newest edition of the Vitamix Classic Blender line, the big "upgrade" that the 780 has is the touch screen control panel. Rather than having a variable speed knob with pre-programmed settings on it, the touch-screen features a sliding speed dial. You can also touch the numbers to select the speed. At first glance, I was a bit hesitant about the touch screen. I mean, I've always been find with the regular variable speed knob and I tend to prefer analog controls over the modern day digital ones. But there is one aspect of the touch-screen control panel that makes it worth considering: ease of cleaning. Your blender is in your kitchen which means it's going to get dirty! As you can see by the photo above, the control panel on my older Vitamix is quite worn and has some debris on it. Don't judge! I'm not the neatest person, but it's also not that easy to keep clean with all the crevices. That said, having the touch screen that you can easily wipe down after use is a great if you want to be able to easily keep things looking shiny and new. The tamper is included in every counter-top Vitamix and is an important part of the unit. It's part of what makes the Vitamix one of the best blenders on the market today. No matter which blender you have, you'll run into a situation where the ingredients aren't coming in contact with the blades. They can be stuck on the sides, floating at the top or something else. By "tamping" them down you help your blender create a vortex and save yourself the trouble of having to stop and re-adjust ingredients. It's extremely helpful for turning much needed fruits and vegetables into a silky smooth drink that's easy to consume. The classic Vitamix Jar is still 64 oz, but stands a few inches higher than the low-profile container that comes with the 780. There are some positives and drawbacks to the wide container. The positive is that the wider bottom makes it easier to chop larger amounts of food and prevents build up under the blades. This is because it allows for greater amount of weight distribution. It's is also easier to store and fits better under cabinets. The negative is that it you tend to have to add more ingredients to it at a given time. A narrower/smaller container is more effective at blending smaller batches. Vitamix does sell different sized containers (such as a 32-oz) that are compatible with the G-series blenders such as the 780. So if you find that you're having issues, the option is always there. As I always like to mention, I love the Vitamix warranty. It's one of the main reasons the company has been around for over 95 years. The 780 comes standard with the 7-year warranty. This should give you peace of mind that it's going to be a staple in your kitchen for years to come. Personally, I've found the Vitamix customer service team to be a joy to work with. They've done some fixes for me over the years and the process was absolutely painless. Vitamix blenders didn't always have a pulse feature, but the 780 does. On some of the older Classic models like the 5200, you have to actually flick the blender on and off to pulse it. Not a huge deal, but the addition of a dedicated pulse function is a lot more convinient. It's also probably better for the health of the motor and electrical components. As I've said in the past, these are nice to have, but I don't find them 100% necessary, just an added convenience. With the variable speed control and tamper, you can achieve all the same results without any pre-programmed functions, especially once you get some practice using the blender. The Vitamix 780 comes standard with a tamper and cookbook. There are several other compatible containers that you can use on the G-Series 780, but they're sold separately. It may be worth considering one of these smaller containers if you're a single person blending smaller batches. There are a large number of online retailers that you can get the Vitamix 780 from. This includes Vitamix themselves. Other retailers like Amazon, Crate and Barrel, Sur La Table and Sears also carry the product. Personally, I like to shop around for the best price, so be sure to do your due diligence and check all around if that's what you've decided on. Also - be sure you're buying from the retailers themselves or an authorized third party merchant. The MSRP of the Vitamix 780 according to the Vitamix website is $719.95 at the time of writing this (4/8/2018). However, you may be able to find it cheaper from other online retailers. 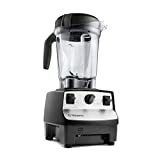 For the refurbished, the MSRP is $399.95 on the Vitamix website. As always - these costs are subject to change at any time. Going with a reconditioned 780 can potentially save you a few bucks. Just make sure it's Vitamix certified reconditioned and not just "used". It comes with standard 5-year warranty instead of a 7 and that's the only real difference. It's really just up to you if you want to make the trade off. It passes a rigorous 17-point checklist to make sure it works the same. For someone on a budget who doesn’t care about fancy new technology, I would get a Refurbished 5300. It’s still got a great 5-year warranty and you’ll probably be able to find it at an extremely affordable price. With your tamper and variable speed controls, you’ll be able to blend anything your heart desires. If I wanted the latest and greatest with the newest technology, I’d get the Ascent A2300. It’s got much better features than the 780 and a longer warranty. What Vitamix has done with the Ascent line is a huge step toward the future of blenders. Best of luck on your blending adventures!